A few months ago, I wrote a review of Nasty Savage's Wage of Mayhem release. 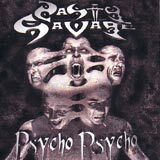 This EP served as warm-up for this full Length release Psycho Psycho. The band has not missed a beat and have delivered a strong album for their fans. Psycho Psycho is the band's first full length album since 1989's Penetration Point. If you've ever owned or appreciated a Nasty Savage album from the 80's, you'll definitely like this release. The band has picked up right where they left off. Nasty Savage is still playing their blend of aggressive, power/thrash metal that drawn a significant underground following over the years. You won't find any sort of variation of "A Tout Le Monde" on this release, just the same balls to the wall heavy metal that you would expect from this band. Vocalist Ronnie Galetti's voice has weathered the band's long hiatus very well, as his delivery is just as forceful and energetic (if not more so) than in the past. He is able to add a lot of character to the songs with his ability to deliver a deep growl or a high pitched shriek when called to do so. The whole album itself is very consistent thanks to some quality song writing. While each of the songs have a certain degree of catchiness to them, the music also takes a few left turns to prevent things from getting stale or predictable. You'll hear a few time and tempo changes throughout, as well as some shifts in mood throughout an individual song. There is no shortage of thrashy riffs and guitar shreds on this album. Remember when Metallica actually used guitar solos in their songs? Sorry, couldn't resist. The rhythm section is in full force, with the intense and diverse drum work laying a solid foundation for the sound. Well place cymbal crashes and a constant double kick drum beat give the songs that extra dose of aggressiveness that fans will eat up. Unlike some thrash bands that lost their edge and attitude over the years, Nasty Savage still sounds like they have the hunger and attitude that they did some 20 years ago when this style of metal was still new. Without a doubt, Nasty Savage fans will find the reformation of the band to be a successful endeavor. I would also think that the band will gain some new fans with this release. This back to basics, old school style of thrash metal isn't exactly being released on constant basis these days. With any kind of promotion, this quality release should find its way into the CD cabinets of many thrash fans who may be even be new to the band.